Terrorists attacked police in revenge for dropped Koran, used child to smuggle in bomb materials. The Shin Bet, Israel’s internal security service, revealed Sunday that its operatives exposed a Hamas-linked terrorist cell in March. Members of the cell have been arrested. The terror cell was behind recent violence on the Temple Mount. Among the attacks it carried out was a firebomb attack on police officers in which nine were injured. Five people were arrested for membership in the terrorist cell. Most are resident of the Jerusalem neighborhood of Shuafat, an urban “refugee camp” where anti-Israel violence is not uncommon. Among the cell members are Mohammed Ali Ahmed Farhan, 26, Mamoun Ali Ahmed Farhan, 21, and Adi Tasir Mohammed Abu Saad, 22. All are affiliated with Hamas. Mohammed Farhan has served time in prison for previous terrorist attacks, including a 2005 stabbing and rock attacks on the Temple Mount. 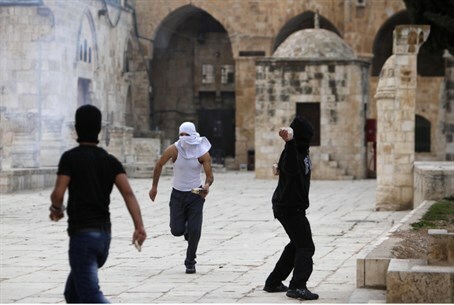 The detainees have confessed to throwing firebombs at police from the Al Aqsa Mosque. They revealed that they had used a minor to bring bomb materials to the site, knowing that police were unlikely to search a child. They said they were motivated by what they termed police desecration of the Koran on the Temple Mount. One month ago a copy of the Koran fell when a police officer moved a chair in the area.